It's that time again...Unity Friends with Flair Friday! Woot woot! :) To find a complete list of bloggers participating in the hop today, please visit the Unity blog. This is the first FWF Friday that I have participated in for quite awhile, and I am so thrilled to be back! I can't wait to see all of the yummy Unity style inspiration waiting for me along the hop. This card is based on a sketch for Truly Scrumptious Challenge #35. I went CRAZY and combined patterned papers from multiple manufacturers (gasp), which is something I rarely trust myself to do. LOL The stamps used are from the Everyday Adorable kit, one of my very favorite Unity kits. Thank you so much for taking the time to pop by my blog today! Great card - the colors are great and I love those stamps! So lovin' this card!!! Love the bright colors!! Love it! The papers are so pretty together and the image is so cute. Great card Anita! Love the colours...so bright and cheerful. Oh how cute! Fabby colors! I love the colors. Beautiful! Love all the different dp's -- what a fun card! LOVE your card--love combining patterned papers--yours are so cheerful. Oh this is so cute and I love the ribbon!!!! How sweet and adorable is this! love your colors.. great design! Love this!! So bright and happy! Love the vibrant colors in the DP! So cute! How adorable! Love the bright colors! The papers all work together! I don't have any Ippity stamps but after looking through your blog, I think you've got me convinced! 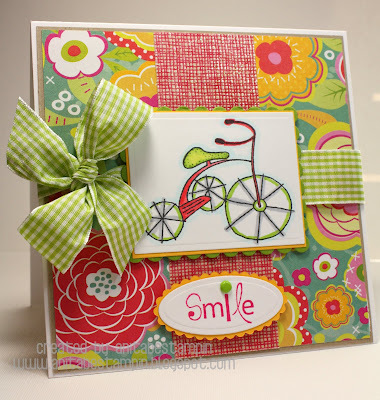 Love this cute little card and all the bright colors. Anita, such a pretty card! I love your mix of colors and papers! Oh, how happy and pretty! I just adore that bow! Way to be brave and combine the papers - love the result! I love the bright colors in your card! Love it! Great job with the patterns and colors! Glad you are back! This is just adorable Anita! Love how happy it is!! WOW!!!! I love this- great job!! Bike cards are so the thing! Way tor make it bright and cheerful! Luv it! cute, cite, cute!!! and brave with the papers! but it wprks so we;;!! totally lvoe it!!!! stunning card Anita.. love the bright colours and that grea green ribbon bow.. beautiful. What a cute card! I lurrrrrve that bow! That is very sweet and cute I love that paper and colors! Anita, this is Beautiful! I love how bright and Happy this card makes me feel!